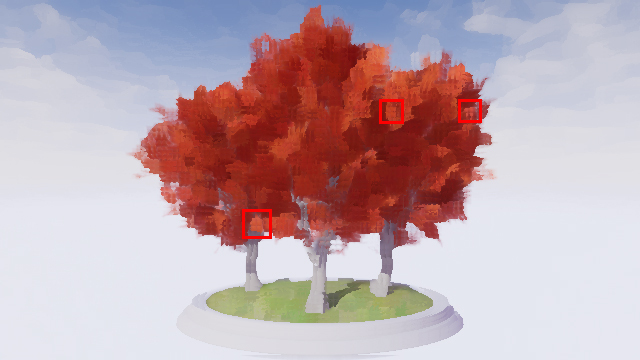 In this Unreal Engine 4 tutorial, you will learn how to make your game look like a painting by implementing Kuwahara filtering. As time passes, video games continue to look better and better. And in an era of video games with amazing visuals, it can be hard to make your game stand out. A way to make your game’s aesthetic more unique is to use non-photorealistic rendering. Non-photorealistic rendering encompasses a wide range of rendering techniques. 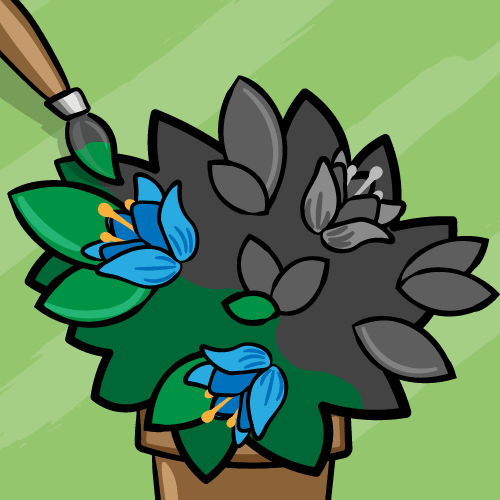 These include but are not limited to cel shading, toon outlines and cross hatching. You can even make your game look more like a painting! One of the techniques to accomplish this is Kuwahara filtering. Note: This tutorial assumes you already know the basics of using Unreal Engine. If you are new to Unreal Engine, check out our 10-part Unreal Engine for Beginners tutorial series. Since this tutorial uses HLSL, you should be familiar with it or a similar language such as C#. To save time, the scene already contains a Post Process Volume with PP_Kuwahara. This is the material (and its shader files) you will be editing. To start, let’s go over what the Kuwahara filter is and how it works. When taking photos, you may notice a grainy texture over the image. This is noise and just like the noise coming from your loud neighbors, you probably don’t want to see or hear it. A common way to remove noise is to use a low-pass filter such as a blur. 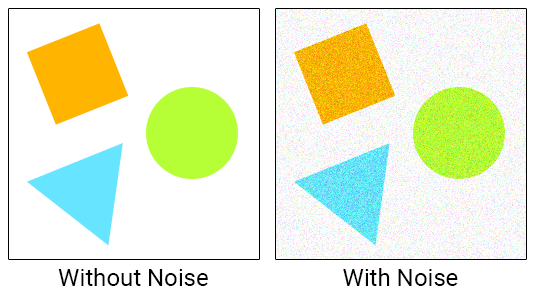 Below is the noise image after box blurring with a radius of 5. Most of the noise is now gone but all the edges have lost their hardness. If only there was a filter that could smooth the image and preserve the edges! As you might have guessed, the Kuwahara filter meets these requirements. Let’s look at how it works. Like convolution, Kuwahara filtering uses kernels but instead of using one kernel, it uses four. The kernels are arranged so that they overlap by one pixel (the current pixel). Below is an example of the kernels for a 5×5 Kuwahara filter. First, you calculate the mean (average color) for each kernel. This essentially blurs the kernel which has the effect of smoothing out noise. For each kernel, you also calculate the variance. This is basically a measure of how much a kernel varies in color. For example, a kernel with similar colors will have low variance. If the colors are dissimilar, the kernel will have high variance. Note: If you’re not familiar with variance or how to calculate it, check out Standard Deviation and Variance on Math is Fun. Finally, you find the kernel with the lowest variance and output its mean. This selection based on variance is how the Kuwahara filter preserves edges. Let’s look at a few examples. Below is a 10×10 grayscale image. You can see that there is an edge going from the bottom-left to the top-right. You can also see that some areas of the image have noise. As you can see, kernels lying on the edge have varying colors. This indicates high variance and means the filter will not select them. By not selecting kernels lying on an edge, the filter avoids the problem of blurred edges. 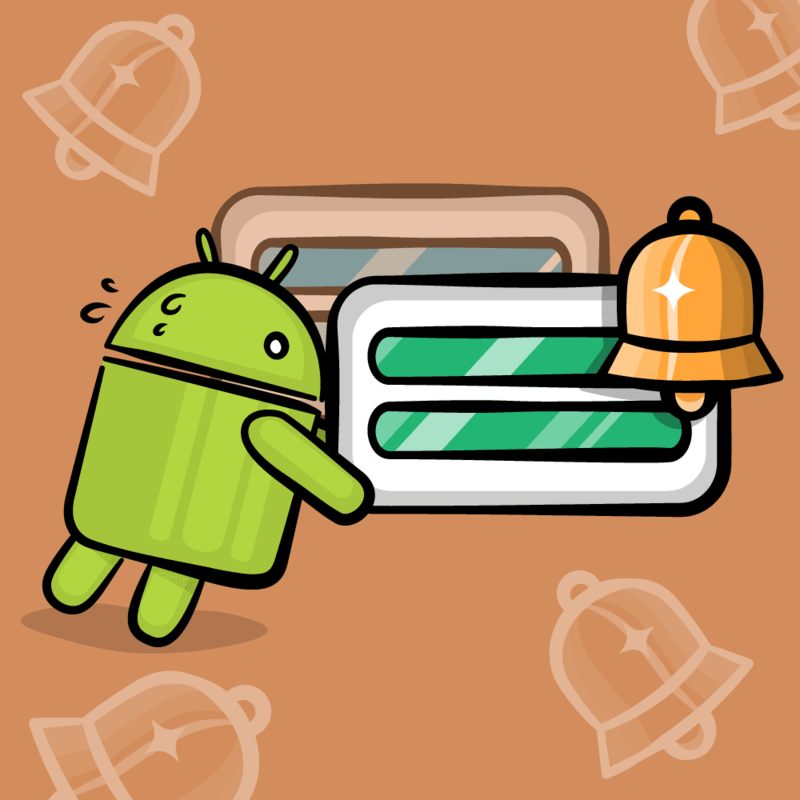 For this pixel, the filter will select the green kernel since it is the most homogeneous. The output will then be the mean of the green kernel which is a color close to black. This time the yellow kernel has the least variance since it’s the only one not on the edge. So the output will be the mean of the yellow kernel which is a color close to white. Below is a comparison between box blurring and Kuwahara filtering — each with a radius of 5. As you can see, Kuwahara filtering does a great job at smoothing and edge preserving. In this case, the filter actually hardened the edge! Incidentally, this edge-preserving smoothing feature can give an image a painterly look. Since brush strokes generally have hard edges and low noise, the Kuwahara filter is a great choice for converting realistic images to a painterly style. It looks pretty good, doesn’t it? Let’s go ahead and start creating the Kuwahara filter. For this tutorial, the filter is split into two shader files: Global.usf and Kuwahara.usf. The first file will store a function to calculate a kernel’s mean and variance. The second file is the filter’s entry point and will call the aforementioned function for each kernel. First, you will create the function to calculate mean and variance. Open the project folder in your OS and then go to the Shaders folder. Afterwards, open Global.usf. Inside, you will see the GetKernelMeanAndVariance() function. Now it’s time to start sampling. This will give you all the offsets for the kernel. For example, if you are sampling the top-left kernel and the filter has a radius of 2, the offsets will range from (0, 0) to (-2, -2). The first line will get the sample pixel’s offset and convert it to UV space. The second line will use the offset to get the sample pixel’s color. Next, you need to calculate the mean and variance. The first two lines will calculate the mean and variance. However, there is a problem: the variance is spread across the RGB channels. To fix this, the third line sums the channels up to give you the total variance. Finally, the function returns the mean and variance as a float4. The mean is in the RGB channels and variance is in the A channel. This will get the mean and variance for each kernel in the following order: top-left, top-right, bottom-left and then bottom-right. Next, you need to select the kernel with lowest variance and output its mean. 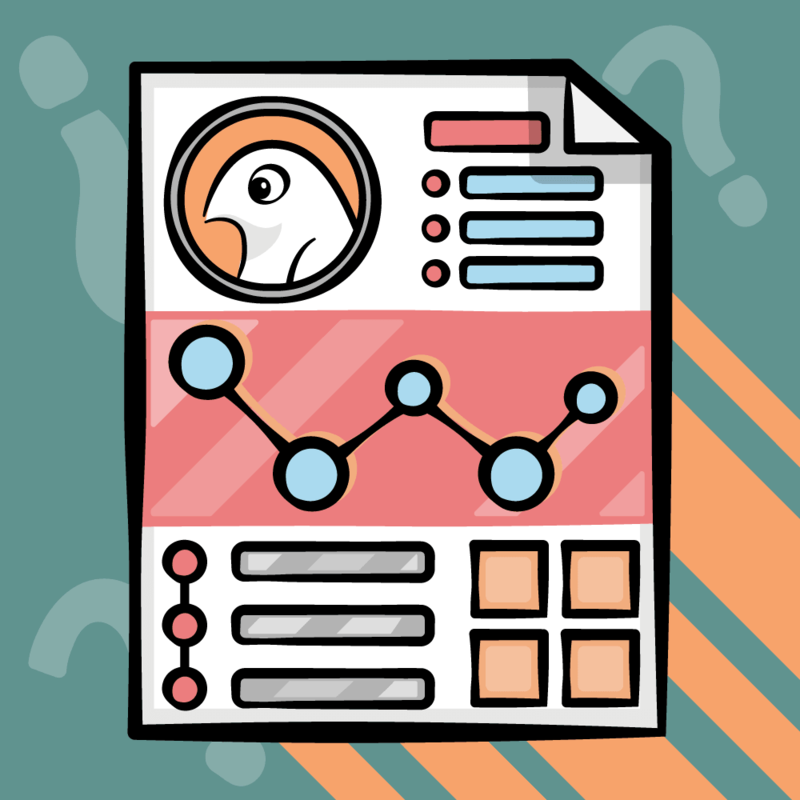 Create two variables to hold the final color and minimum variance. Initialize both of these to the first kernel’s mean and variance. Loop over the remaining three kernels. If the current kernel’s variance is lower than the minimum, its mean and variance become the new FinalColor and MinimumVariance. After looping, the output is FinalColor which will be the mean of the lowest variance kernel. Go back to Unreal and navigate to Materials\PostProcess. 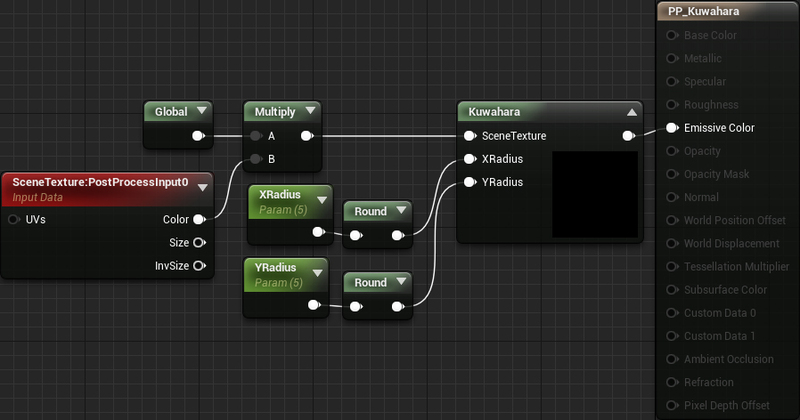 Open PP_Kuwahara, make a dummy change and then click Apply. Go back to the main editor to see the results! This is a side effect of using axis-aligned kernels. A way to reduce this is to use an improved version of the filter which I call the Directional Kuwahara filter. Note: Since you can represent a kernel as a matrix, you write the dimensions as Height x Width instead of the conventional Width x Height. More on matrices later. Here, the filter determines the pixel’s orientation to be along the edge. It then rotates the entire kernel accordingly. To calculate the local orientation, the filter does a convolution pass using Sobel. If Sobel sounds familiar to you, it’s probably because it is a popular edge detection technique. But if it’s an edge detection technique, how can you use it to get local orientation? To answer that, let’s look at how Sobel works. Instead of one kernel, Sobel uses two. First, convolve the middle pixel with each kernel. 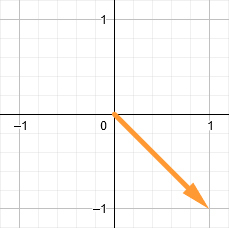 If you plot each value onto a 2D plane, you will see that the resulting vector points in the same direction as the edge. 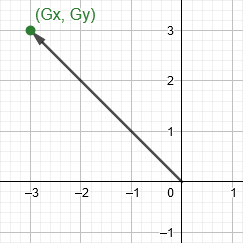 To find the angle between the vector and the X-axis, you plug the gradient values into an arc tangent (atan) function. You can then use the resulting angle to rotate the kernel. And that’s how you can use Sobel to give you a pixel’s local orientation. Let’s try it out. Note: Notice that the final brace of GetPixelAngle() is missing. This is intentional! Check out our Custom Shaders in HLSL tutorial to see why you need to do this. The first two lines will get the sample pixel’s color. The third line will then desaturate the color to convert it into a single grayscale value. This makes it easier to calculate the gradients of the image as a whole instead of getting the gradients for each color channel. 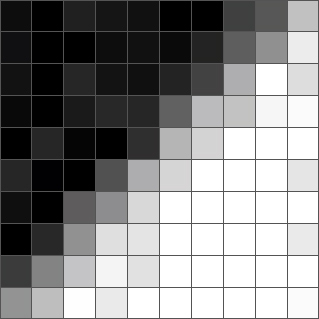 For both kernels, multiply the pixel’s grayscale value with the corresponding kernel element. Then add the result to the appropriate gradient variable. i will then increment to hold the index for the next kernel element. Now that you have a function to get a pixel’s angle, you need to somehow use it to rotate the kernel. A way to do this is to use a matrix. Note: You can actually do the rotation with some basic trigonometry instead but I thought it’d be a good chance to teach matrices since they’re very handy. By itself, a matrix doesn’t look very interesting. But the matrix’s true power reveals itself once you multiply a vector with a matrix. This will allow you to do things such as rotation and scaling (depending on the matrix). But how exactly do you create a matrix for rotation? In a coordinate system, you will have a vector for every dimension. These are your basis vectors and they define the positive directions of your axes. Below are a few examples of different basis vectors for a 2D coordinate system. 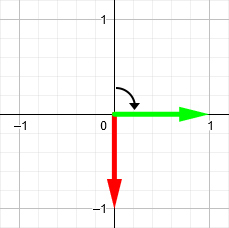 The red arrow defines the positive X direction. The green arrow defines the positive Y direction. To rotate a vector, you can use these basis vectors to build a rotation matrix. 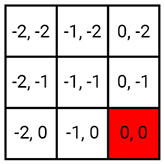 This is simply a matrix containing the positions of the basis vectors after rotation. 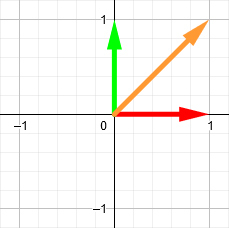 For example, imagine you have a vector (orange arrow) at (1, 1). Let’s say you want to rotate it 90 degrees clockwise. First, you rotate the basis vectors by the same amount. 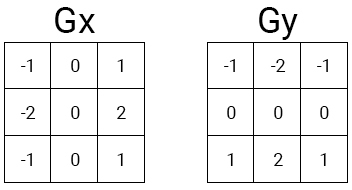 Then you construct a 2×2 matrix using the new positions of the basis vectors. The first column is the red arrow’s position and the second column is the green arrow’s position. This is your rotation matrix. Finally, you perform matrix multiplication using the orange vector and rotation matrix. The result is the new position for the orange vector. Note: You don’t need to know how to do matrix multiplication since HLSL already has a built-in function for it. But if you’d like to learn, check out How to Multiply Matrices on Math is Fun. Isn’t that cool? What’s even better is that you can use the matrix above to rotate any 2D vector 90 degrees clockwise. For the filter, this means you only need to construct the rotation matrix once for each pixel and then you can use it for the entire kernel. Now it’s time to rotate the kernel using a rotation matrix. 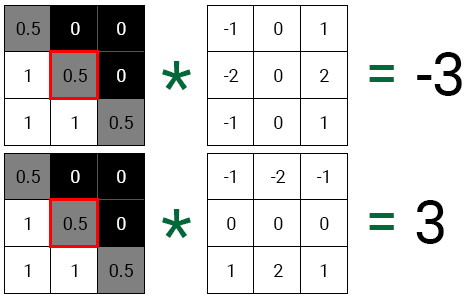 mul() will perform matrix multiplication using the offset and RotationMatrix. This will rotate the offset around the current pixel. Next, you need to construct the rotation matrix. The first line will calculate the angle for the current pixel. The second line will then create the rotation matrix using the angle. That’s all for the Directional Kuwahara! Close Kuwahara.usf and then go back to PP_Kuwahara. Make a dummy change, click Apply and then close it. Below is a comparison between the original Kuwahara and Directional Kuwahara. Notice how the Directional Kuwahara does not have the blockiness of the original. Note: You can use PPI_Kuwahara to change the dimensions of the filter. I recommend that you change the filter size so that the X radius is larger than the Y radius. 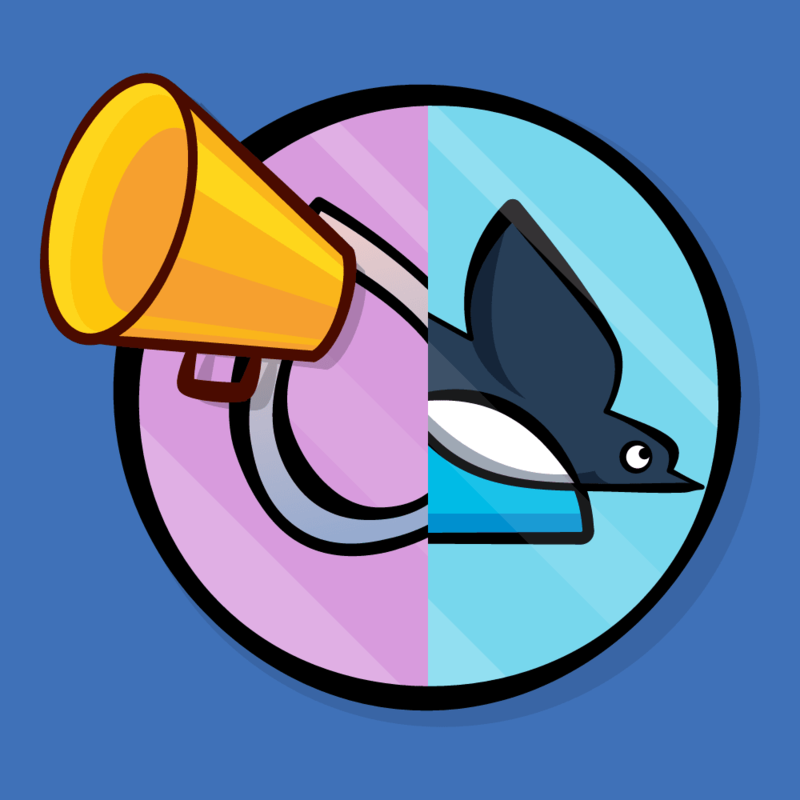 This will increase the kernel’s size along the edge and helps with directionality. You can download the completed project using the link at the top or bottom of this tutorial. If you’d like to learn more about the Kuwahara filter, check out the paper on Anisotropic Kuwahara filtering. The Directional Kuwahara is actually a simplified version of the filter presented in the paper. Using your new-found love of matrices, I encourage you to experiment with them to make new effects. 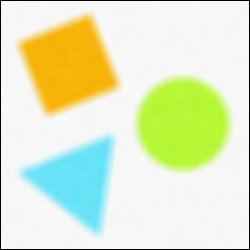 For example, you can use a combination of rotation matrices and blurring to create a radial or circular blur. If you’d like to learn more about matrices and how they work, check out 3Blue1Brown’s Essence of Linear Algebra series. If there are any effects you’d like to me cover, let me know in the comments below!